3886 ✉ 115 2 Fr. 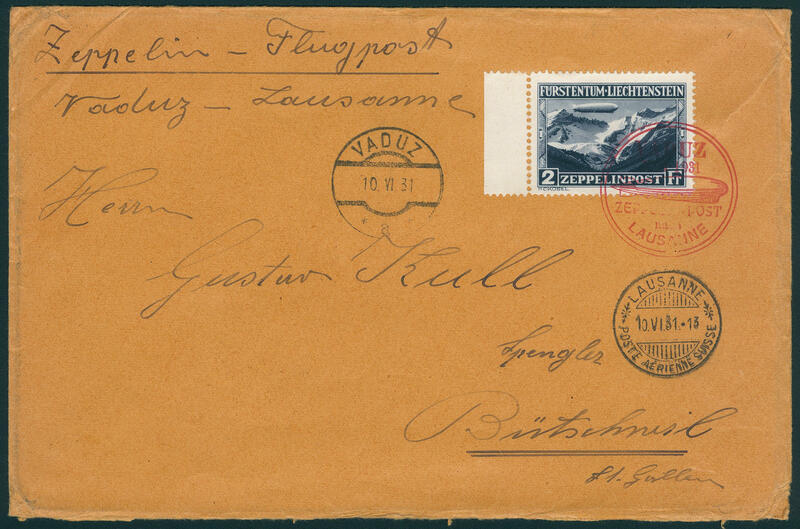 Zeppelin 1931, from left margin of sheet as a single franking on obviously overweight Zeppelin cover with red special cancellation \"VADUZ to LAUSANNE Zeppelin mail 10. VI. 31. 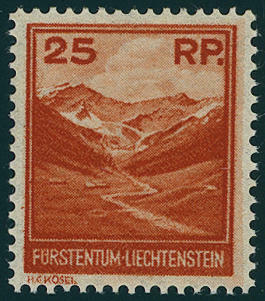 \" to Bütschwil / Switzerland with transit and arrival postmarks. 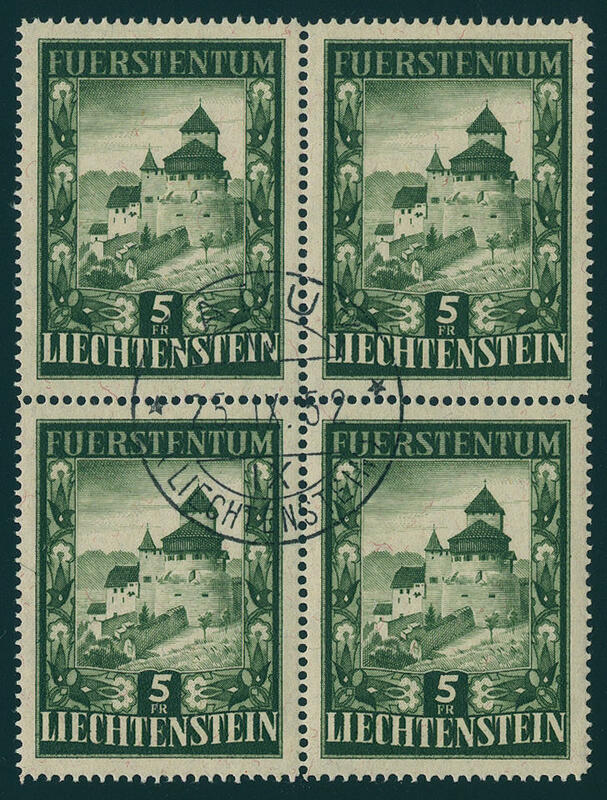 3887 119/21 Landscapes and building 1933, all three values fresh colors and very well perforated, in perfect condition mint never hinged, uniform from of the right lower corner of the sheet, the good 25 Rp. With photo certificate \"mint never hinged perfect\" Marxer SBPV. Michel 1000,- €. 3888 119/21 Postage stamps set 1933, all three values fresh colors and in perfect condition mint never hinged, without any signs. Photo expertize Reinhardt BPP. Michel 1000,- €. 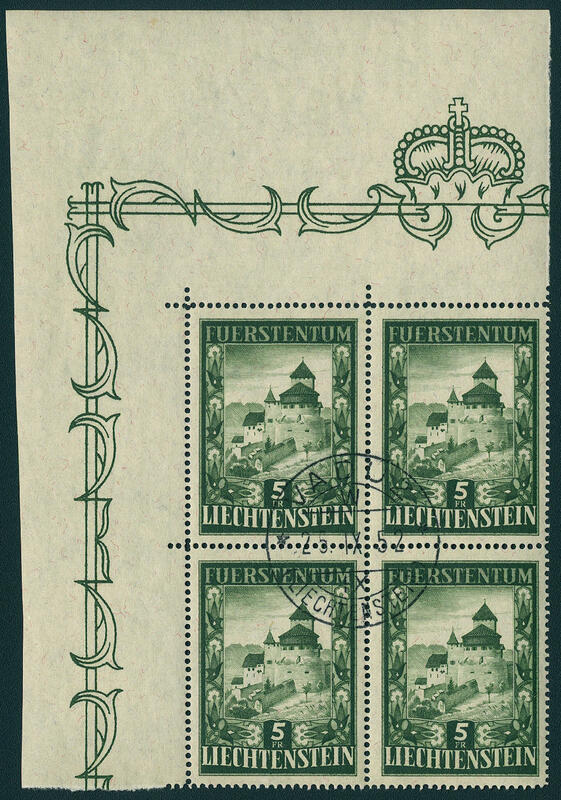 3889 Bl.1 Vaduz souvenir sheet 1934, fresh colors and in full original size, in perfect condition mint never hinged in utterly perfect condition. An outstanding quality this sought-after issue, without any signs! Photo expertize \"mint never hinged perfect\" Marxer BPP. Michel 2800,- €. 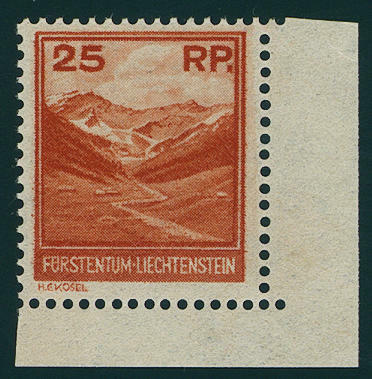 3890 ⊙ Bl.1 Vaduz souvenir sheet 1934, wonderful fresh colors and in full original size with perfect mounted clear exhibition special cancel \"VADUZ 29. IX. 34. \" from first day. A souvenir sheets in outstanding quality for the highest standards! Photo expertize \"perfect quality\" Dr. Hoffner / SBPV. 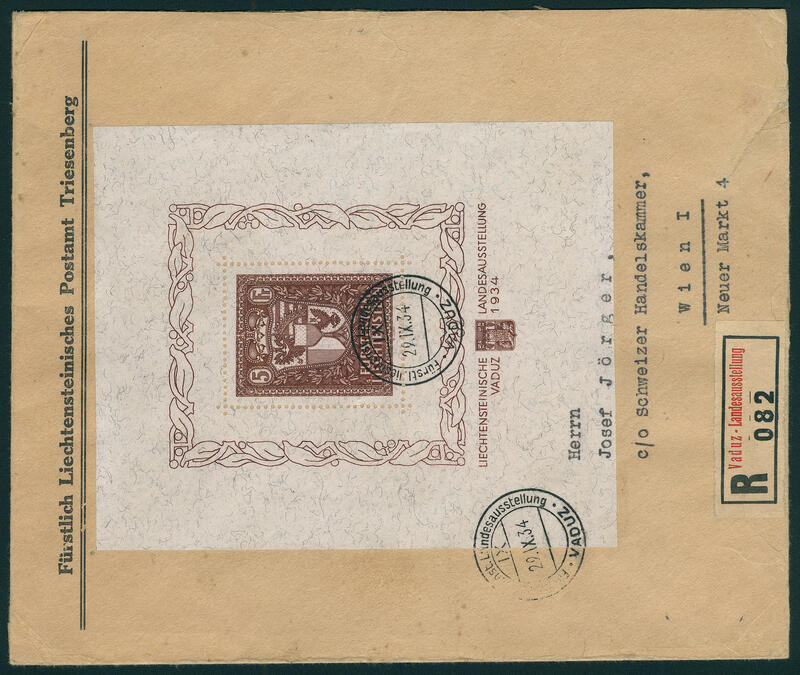 3891 FDC Bl.1 Vaduz souvenir sheet 1934, fresh colors and in original size on decorative registered First Day Cover with first day special cancel \"VADUZ 29. IX. 34. \" to Vienna with appropriate special registration note. Rare! 3892 GeF.Heft 140/42 Postage stamps set 1933, fresh colors and in perfect condition in the wonderful gift booklet \"to the 10. Anniversary of the government start his serenity of the Sovereigns Francis I. 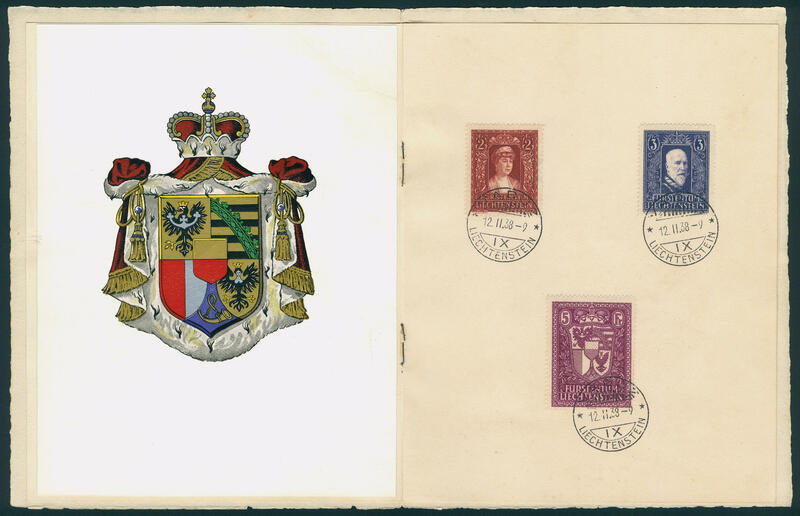 \" with colored coat of arms and all values perfect used \"VADUZ 12. II. 38. \". It were only a few examples at high place personalities handed over. A Honor for the sophisticated special collection! 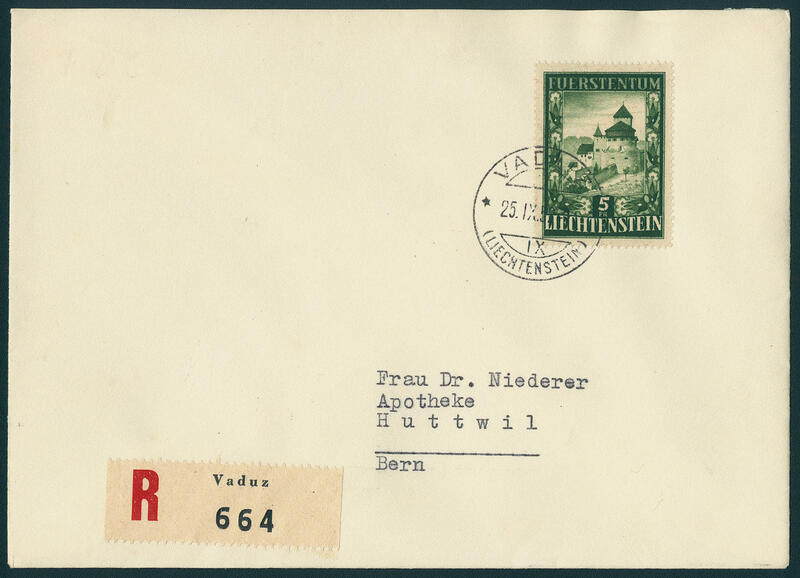 3893 ✉ 149/50 Zeppelin series 1936 in perfect condition on very nice registered Zeppelin cover from \"ESCHEN 5. 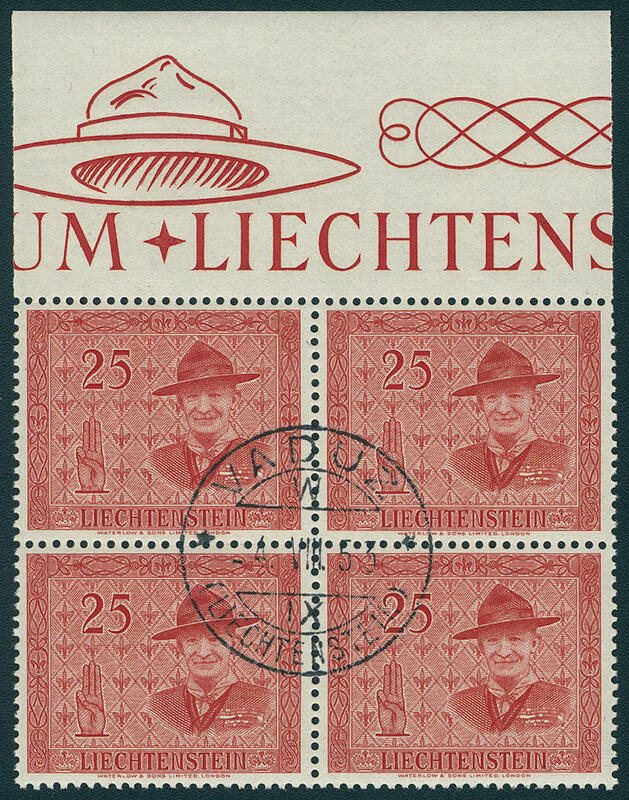 V. 36\" with red special confirmation stamp to the United States with arrival postmark. Very decorative! 3894 185P2 5 Fr. Prince Francis Joseph II. 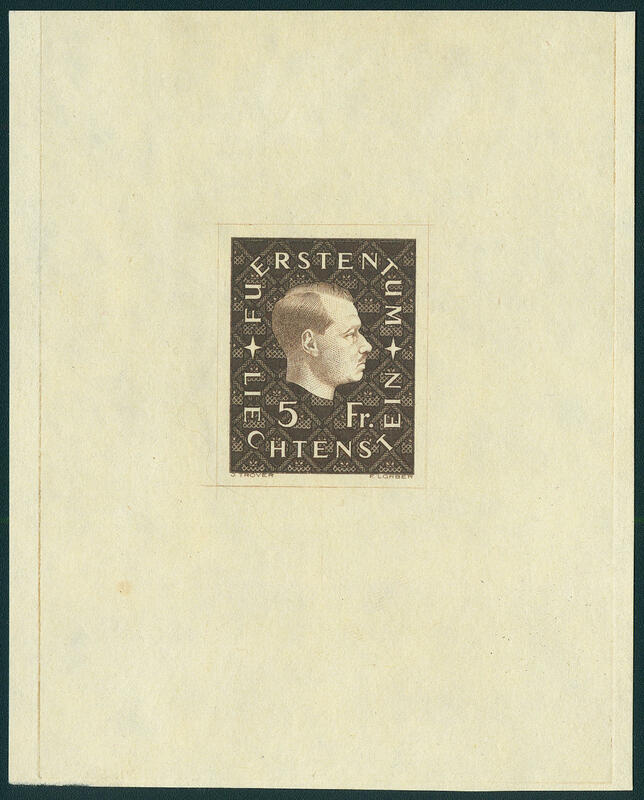 1939, the very scarce proof in brown in the sheetlet format unperforated in perfect condition. 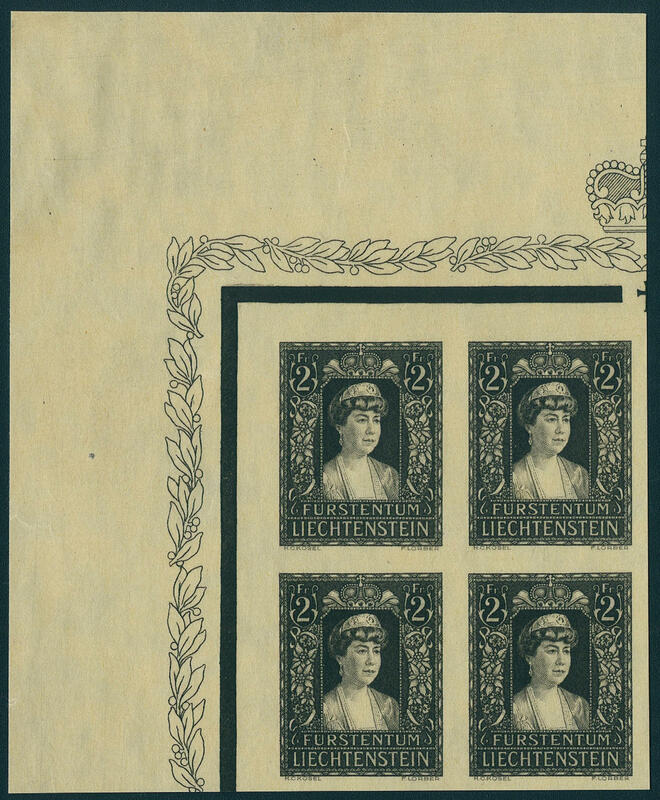 In this kind extraordinarily rare, in the Michel special catalogue only in perforated form indicates. Photo expertize Marxer SBPV. 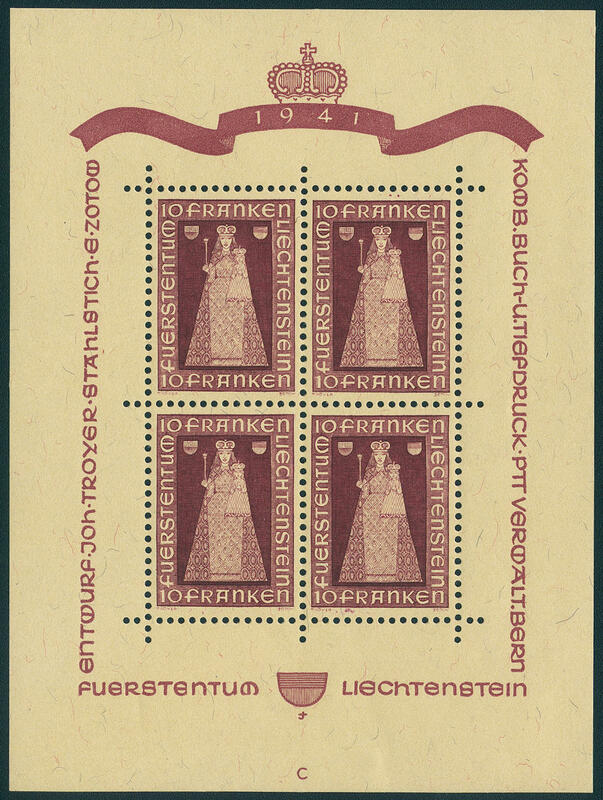 3895 197 Madonna from Dux miniature sheet 1941, in perfect condition mint never hinged Michel 500,- €. 3896 256U 2 Fr. Princess elsa 1947 unperforated block of four from the left upper corner, in perfect condition on ungummed paper, utterly perfect condition. 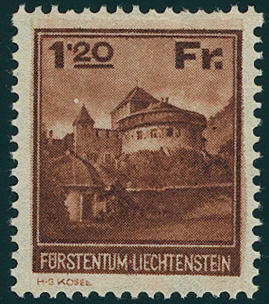 Become already unperforated single pieces of this variety hardly ever offered, so it concerns an by this corner margin block of four about an extraordinary Liechtenstein rarity! Photo expertize \"perfect\" Peter Marxer. 3897 267IV 5 Rp. On 3 Rp. Postal stamps 1949 block of four, left upper stamp with scarce overprint error \"PRP retroactive imprinted and to the right shifted\", in perfect condition mint never hinged these scarce variety came only on field 16 of the sheet in a very small part of issue before. Photo expertize Marxer. Michel 1400,- €. 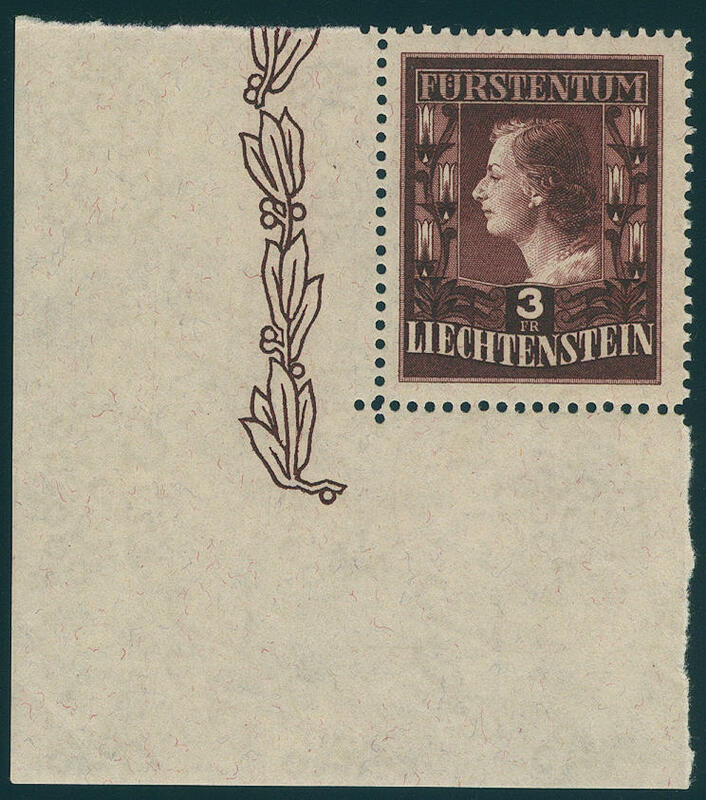 3899 FDC 304/05A Prince and Princess 1951, wide perforated, in perfect condition on very nice registered First Day Cover from \"VADUZ 20. XI. 51. 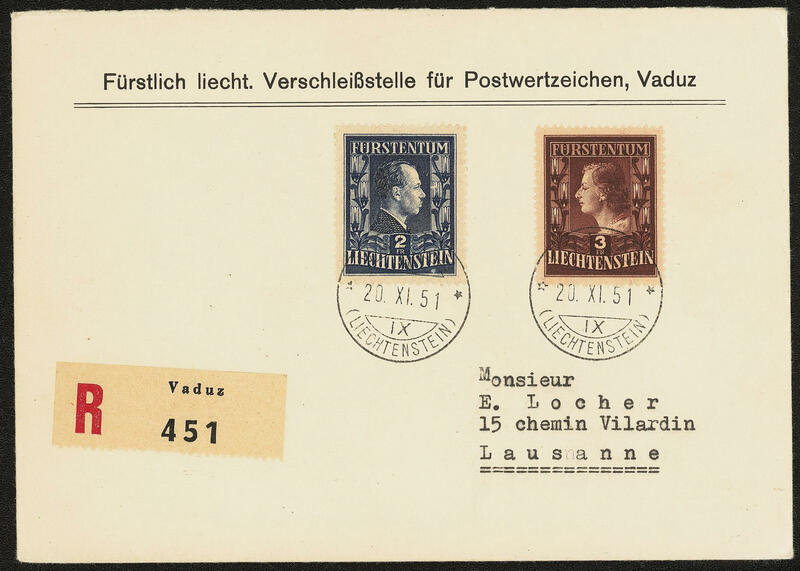 \" to Lausanne with arrival postmark. Michel 1400,- €. 3900 ⊙ 309 5 Fr. 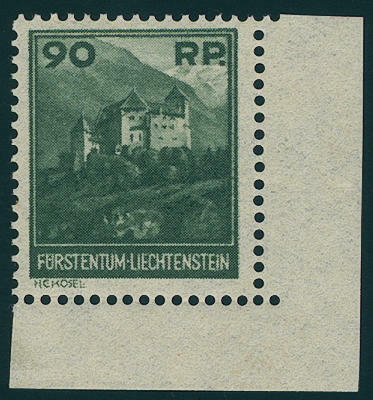 Castle Vaduz 1952, wonderful block of four from the left upper corner, fresh colors and very well perforated with centered clear first day cancel \"VADUZ 25. IX. 52. \". For the highest standards! Michel 960,- €. 3901 ⊙ 309 5 Fr. 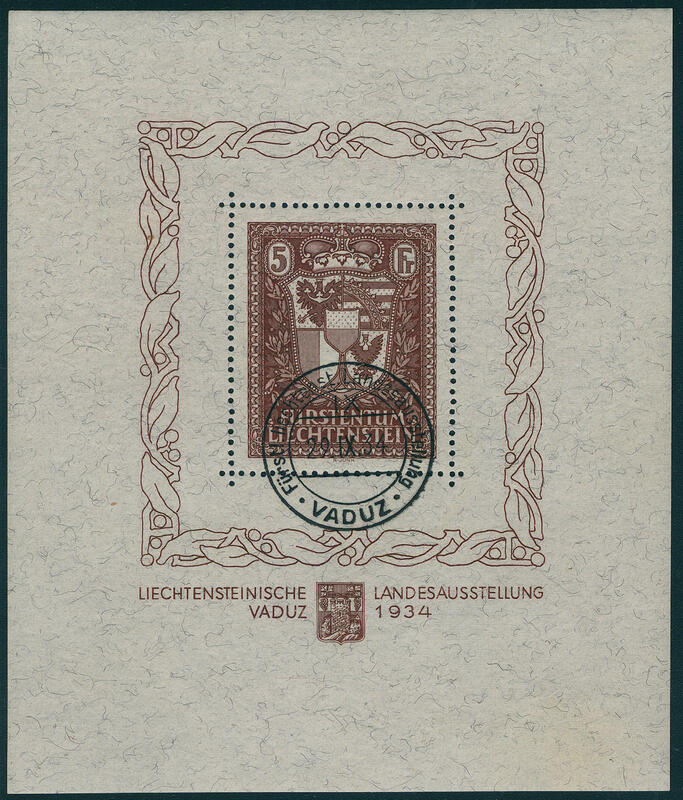 Castle Vaduz 1952, wonderful block of four, fresh colors and very well perforated, especially nice centric and neat cancelled \"VADUZ 25. IX. 52. \" from first day. For the highest standards! Michel 960,- €. 3902 FDC 309 5 Fr. 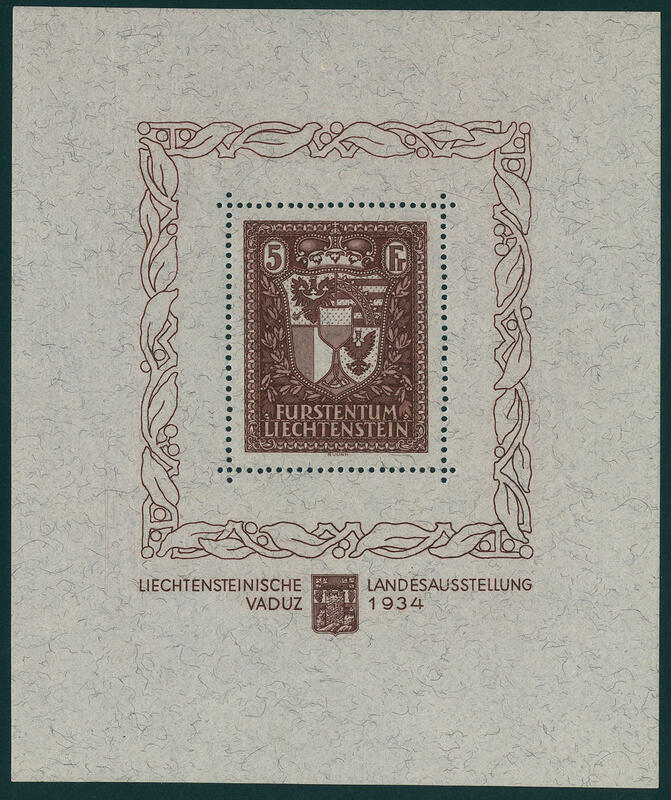 Castle from Vaduz, in perfect condition on very nice registered First Day Cover from \"VADUZ 25. IX. 52. 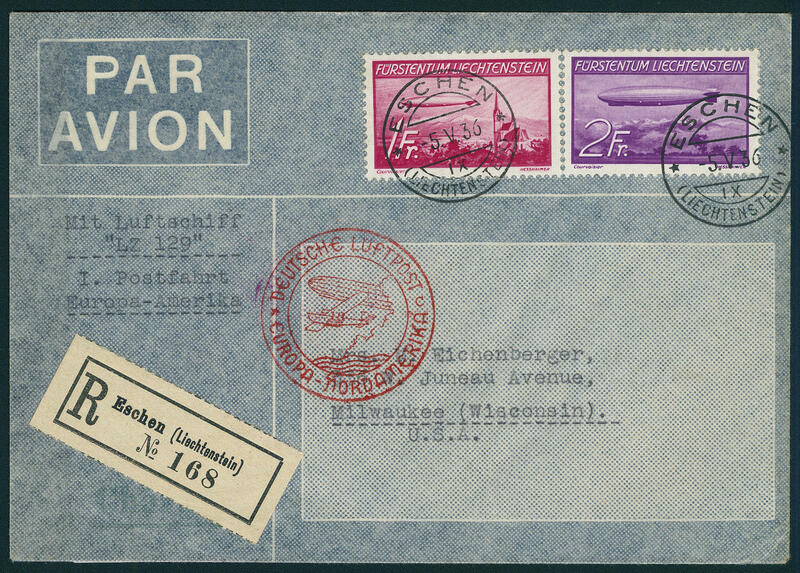 \" to Huttwil / Switzerland with arrival postmark. Michel 800,- €. 3903 FDC 309 5 Fr. 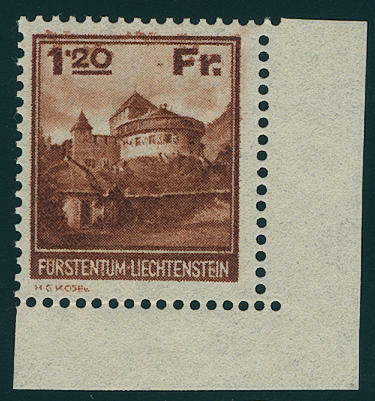 Castle Vaduz on faultless registered First Day Cover from \"MAUREN 25. IX. 52. 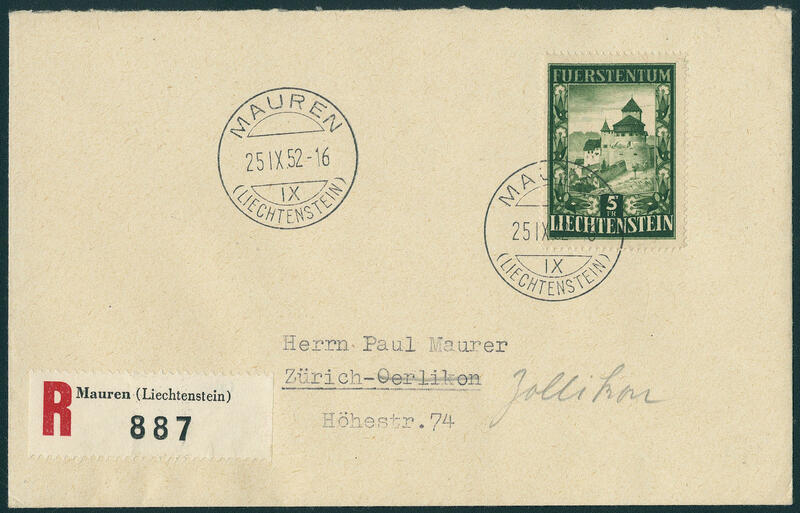 \" to Zurich Zollikon with arrival postmark. Michel 700,- €. 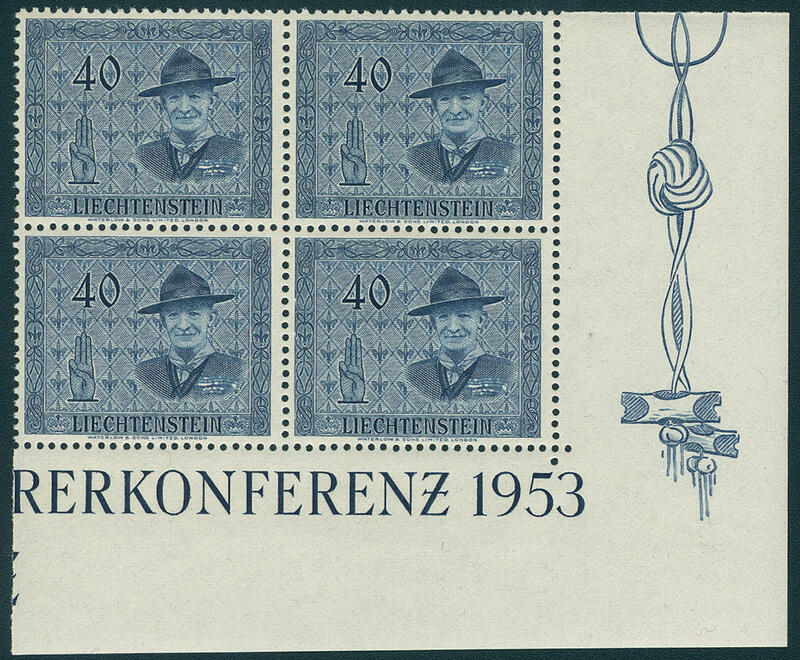 3904 315/18 Scout 1953, block of four set from of the right lower corner of the sheet unfolded and in perfect condition mint never hinged Michel 260,- €. 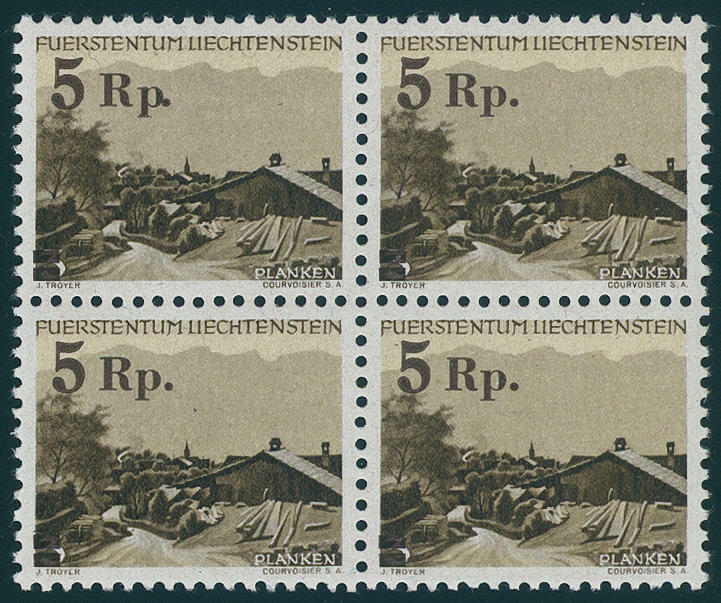 3905 ⊙ 315/18 Scout 1953, block of four set from upper margin with centered first day cancel \"VADUZ 4. VIII. 53. \". Very nice set! Michel 260,- €.